The Division of Response-Ability. If you want to know what you're made of, . . . watch what comes out of you under pressure! When life squeezes you with trials and troubles, how do you respond? The Division of Responsibility is drawn: "If it comes out of you, . . . it is yours." You are the author of all your responses: the good, the bad, and the ugly! Embracing this principle completely is empowering! For if you are the ultimate author of your thoughts, behaviors, motives, and emotions, then you also possess veto power. Otherwise, you're stuck! 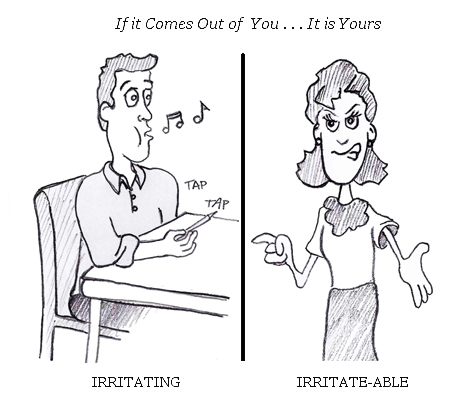 Irritating behavior of others presents a Constraint to which you respond. the particular style or Character of your Response. Actions can you change them. With a distinction between cause and constraint in mind, recall the scenario of the creep who cried fire in the crowded theater. All reacted according to the current condition . . . of their disposition. Some People were pushing as opposed to calmly moving out the exits because of Who They Are. They reacted according to their individual excite-ability, the predisposition that they brought with them to the theater before the dunce did his dirty trick. The same disposition they've been shaping since childhood through a pattern of chosen responses. Therefore, some people are more prone to froth with frenzy when constrained by a pressing event. Such people might be termed: Frenzy-able or Frantic-able! Technically speaking, the scrapes and bruises experienced by the theater patrons were directly caused by frenzied people pushing from behind, and not by the bonehead who blurted out the false alarm--this was a constraint. Who's Creating the Wake? Visualize a boat upon a lake moving through the water ahead. As the boat travels forward, there is a trail of ruffled water that fans out behind called "the wake." In this image, it's completely clear that the boat is powering its way upon the lake, . . . and to imagine that "the wake" has any power to propel the drive and direction of the boat would be . . . ridiculous! The wake behind the boat is analogous to past happenings, and you are in the driver's seat of Life . . . steering your present course. You are moving forward into a future determined by the decisions you make at the wheel. You are creating the wake that trails behind, and EVEN IF you do pass through waters of adversity, you still determine "the wake" by your responses to turbulent conditions. Those who have emotional scars say it this way: "I've been scarred for life, and I'll never be the same." It is true, they will never be the same, . . . but that is also true even when cruising through the waters of everyday life. Whether constraints are passive or compelling, . . . typical or traumatic, the Heisenberg Effect establishes that there is inevitable impact always. thus expanding your character to something better ? and contort your character to the deformities of being bitter ? Choosing the latter alternative is analogous to imagining that "the wake" is propelling the drive and direction of a boat. Yet such is a prominent indoctrination of behavioral science: Human beings are the "cause & effect" products of the past, . . . Who You Are is the necessary result of environmental inputs. But here's a most fascinating twist: The assumptions of "Behaviorism" are absolutely False . . . yet completely True at the same time, . . . depending upon whether You . . . are Being False or Being True. The Goal within Your Control is becoming Loving and True. Free to Choose . . . NOT really. So, given the nature of a Self-Correcting World, . . . Let's grab with gusto, the good stuff! The problem is this: You can't grab the good stuff with gusto, if that emphatic energy is not in you! You can only choose . . . and you will only choose . . . those options you presently feel to choose according to the current condition . . . of your disposition. This points up the need for "Changing Your Stripes." The simplistic notion that there is a world full of thrilling alternatives that await "your choice," is a popular doctrine preached by many self-help gurus. The alluring pitch . . . goes like this: "YOU can create your own reality, YOU can reinvent yourself according to your wildest whims!" And the magic that makes it all happen is through the marvels of mind power. YOU ARE NOT FREE TO CHOOSE! 2) The Power, or Ability, to enact any alternative that you Know. FACT: There IS a world full of alternatives, opportunities, & choices out there! And we possess an awareness of only a small fraction of the whole, and as we are not aware of certain alternatives, we are NOT free to choose them. FACT: Even if we become aware of more alternatives, we may not presently be empowered to enact many of them, let alone, all of them. And if we don't have the ability to enact them, then we are NOT free to do them, hence not free to choose them! The Self as Advertised. An essential key, to being the best you can be . . . is found ironically, in a process of losing: Losing the self-absorbed self. The True Self begins to appear as we cease to be preoccupied with self-image and self-promotion. Managing a self-image is like launching a personal advertising campaign where the superficial product being "sold" is . . . "The Self as Advertised." Personal "ad" campaigns can invest countless hours into crafting presentations for the eyes of others, with the intent of being thought impressive, or competent, or worthy. In schemes of image management, as in advertising strategies, typically it's the sizzle that is sold, and not the bacon. When selling self-promoting "sizzle," beauty is only skin deep, definitely. Those who "sell" glossy facades are motivated by the fear that who they are is not good enough. Insecure people require a mask to hide behind and thus promote personal ad campaigns to prop up an acceptable image. Only people who feel inwardly inadequate have a need to put up a front. While the lies from our lips are more obvious, lies can also be "told" without words. Resentful and accusing emotions are nonverbal lies that we live, . . . wordless emotional lies that are more subtle and insidious. As we harbor irritated and tense emotions, we are caught in the BRIAR. These unsettled emotions show in our very countenance; they reveal our betrayal of Truth. Because these feelings are false, . . . we are Being False as we harbor them. BRIAR Emotions are yet another set of tell-tale signs that signal the loss of Life's inherent harmony. The Light of Innocence. When I am physically cold, if I move from the shadows of darkness into the rays of the sun, I become warm again . . . naturally and consistently. When cold, the Sun warms me as I walk into the Light. When my soul is cold, chilled with the bitterness of resentment and blame, I can move from the shadows of dark emotions into the Light of Inner Innocence, and there I find a gentle contentment that melts my cold emotions. Like the shining rays of the Sun, the Light within illuminates the way. The Light of Innocence guides me to the warmth of Inner Peace. The way to healing and happiness requires the development of discernment, . . . a quiet sensitivity. Only when I hear and heed the gentle whisperings of the Light within can I find the path of Recovery. Walking in darkness makes me deaf: In the shadows of darkness, the chill of agitated emotions grow colder; and worse, I cannot clearly hear the whisperings of the Light, for they are muffled by the confusion of my own mind--drowned out by a relentless inner dialogue of figuring, reasoning, and rationalizing. The Voice of Light is heard in the Light. a place where warmth and peace caress me. Walk in the Light and I am warmed by peaceful radiance. Walk in the Light and I can clearly hear the Whisperings of the Light. As I align myself to my own sense of what is good--my Intuitions of Innocence--I restore harmony and balance to Life, I return to the way I began. Being True means I am aligned to the Light of Innocence. Coming into that warm and peaceful Light naturally relieves me from the chill of darkness, . . . cold emotions depart . . . clarity enters in. Discerning between Fact & Truth. Facts and truth are commonly equated, but there is an important and practical difference between the two: Consider the way facts are used in courts of law to bring about injustice; on this basis alone, Truth needs to be more than a synonym for fact; . . . "Truth" needs its own identity apart from "fact." Facts are technically correct words, both spoken and written; they are accurate statements made by the mouth or penned by the hand. Sometimes the word "fact" is used to mean "reality:" The way things ARE . . . the way the world IS. But then, what word should represent the legal evidence that is used to mislead? In legal arenas, "fact" is often far from a truthful representation of "reality." Since we already have the word "reality" to represent "the way things are," . . . let's use the word "fact" to represent "technically accurate statements" regardless of inward motive of heart. In contrast, the word "Truth" symbolizes a larger "statement" . . . a holistic "statement." Truth is not just factually accurate, . . . but it is also utterly honest; Truth is the whole "statement" of one's total being: A unified expression of word, thought, deed, motive, and emotion--all of which ARE True. Should "the Truth, the whole Truth, and nothing but the Truth" be anything less? When a clear distinction is made between facts and Truth, we realize that words can be factual, . . . yet untrue at the same time; in other words, a person's words may be technically correct, but if the inward intent is not true, then only fact speaking can occur, . . . as opposed to Truth telling. This is the very meaning of empty rhetoric: Words expressed without wholeness of heart. Facts can be conveyed regardless of inward intent of heart; and this means that on the surface words can be technically correct, and at the same time, the heart of the messenger can be incorrect. Part of the rhetorical game of "fact speaking" is picking out certain aspect "from the whole," and just exposing the "the part" that gives a factually accurate appearance in support of an dishonest agenda. Thus, "facts" can be used in the service of lies, while the Truth cannot. Truth is whole: heart, might, mind, and soul. Of course, included in this truthful wholeness is being filled with the bright white energy of true emotion! Thus, a person who is caught in the BRIAR may make verbal claims to truth, but as dark emotions seep to the surface, it becomes conspicuously clear that "fact-speaking" is all a person can do . . . while caught in the thorny trap of Briar Emotions! When Truth is understood and embraced in wholeness, a different way of thinking and seeing the world opens up--a new paradigm is understood. Distinguishing between facts and Truth is vital to Recovering the You . . . that is completely and utterly True. It is essential to the project of "Changing Your Stripes." Changing Your Stripes. The Saying goes, "You can't change a tiger's stripes!" That may be so, as long as a tiger remains a tiger. But what if that striped animal could be changed into a new kind of creature? What if people could change who they are fundamentally, and not just superficially or cosmetically . . . what if people could change their stripes? The truth is you will be who you are until you become someone different. Until you Change Your Stripes, you will bring the old animal with you wherever you go! And as you encounter new situations, you will tend to act according to the old patterns of the old creature, . . . repeating old ways that may not work and may not bring happiness. The common cure for dealing with a tiger-like disposition, explosive and ferocious, is to ship the ornery animal off to a different place—relocate to a new zoo! Or if the tiger is especially tenacious, another cure is to simply leave the cranky creature. Either way, as long as that tiger remains a tiger . . . cutting claws are liable to leave their mark upon new prey . . . in a future day, and the false remedy of relocation will eventually be repeated. When stubborn creatures resist fundamental change from their core, . . . root problems will remain the same even though superficial scenery and appearance may change. You can try to run from your troubles, but you cannot run from yourself. Wherever you go, . . . you will bring yourself with you. Mastering a challenging situation is ultimately a matter of mastering yourself! It is directly "in" our challenges that we find our ultimate destiny. In the ever-appearing adversities of life, we can increase in strength of character; a character that at mortal death is the only possession of which it can be said: "you took it with you." What you will take into the eternal world is . . . what you become! The Book, you will see the particular topics that will explain and enhance your life.